Dieticians warned there may be a risk to people taking carnitine supplements. There has been a wealth of studies suggesting that regularly eating red meat may be damaging to health. In the UK, the government recommends eating no more than 70g of red or processed meat a day – the equivalent of two slices of bacon. Saturated fat and the way processed meat is preserved are thought to contribute to heart problems. However, this was not thought to be the whole story. “The findings support the idea that less red meat is better. He said the findings raised the idea of using a probiotic yogurt to change the balance of bacteria in the gut. 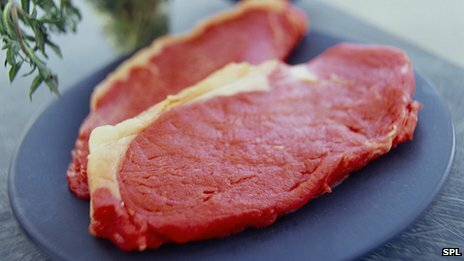 Reducing the number of bacteria that feed on carnitine would in theory reduce the health risks of red meat. Vegetarians naturally have fewer bacteria which are able to break down carnitine than meat-eaters. BOSTON, March 15 — A new study has found that men who drink about a can of full-calorie soda or sugar-sweetened juice a day could be increasing their risk of developing heart disease by about 20 per cent. Published in the journal Circulation, Harvard researchers followed 42,880 men over 22 years, measuring the different lipids and proteins in the participants’ bloodstream. After controlling for risk factors like smoking, physical inactivity, alcohol consumption and family medical history, scientists found that those who consumed sugary beverages on a daily basis had higher levels of triglycerides — or bad fat — and lower levels of good cholesterol or HDL levels compared to men who refrained from sugary drinks. Both biomarkers are known to be associated with a higher risk of heart disease.